Watch ​review from Woman.Driven on the HD-7 four-post lift! Extremely powerful stainless steel wire ropes are rated at 14,400 lbs. each. They're called "aircraft quality" for a reason! The combined rating of these cables is more than 822% of the entire lift’s maximum lifting capacity, and all wire rope is fully enclosed within the lift structure. 10" x 12" base plates provide a stable yet minimal footprint for the HD-7W. 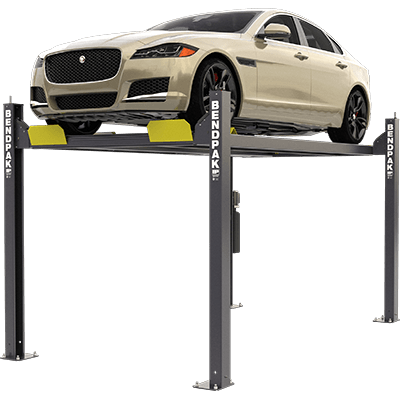 Your four-post lift is as structurally sound as any car lift ever made. Low-profile, 4.5" high runways make it easy to load vehicles onto the lift. Lower runways mean less time driving up the approach ramps; the result is a safer, easier approach.